You have probably seen media reports about the emerging understanding of the benefits that mental exercise brings. Studies have shown that a routine of mental activities can increase your alertness, agility of thought and creativity. Your brain’s health is an important contributor to your quality of life as you age and there appears to be a correlation between your level of mental stimulation and your risk of dementia/Alzheimer’s in later life. Lots of brain fitness resources, including exercises. Braingle claims to have the largest collection of brain teasers, riddles, logic problems, quizzes and mind puzzles on the internet with over 12,000 items which have been ranked by the site’s users. Games and exercises to get your mind into shape. Quiz, memory and brain games to train your thinking. Some simple physical exercises which boost the brain, based on the work of Paul E. Dennison, PhD. In the past, researchers believed that our genes were the main determinants of brain development. Now an increasing number or studies shows that conditions in our suroundings can influence our internal brain plan during early life and in later years. Researchers say the evidence could not only initiate personal behavioral changes, but also could launch new behavioral therapies and medications that repair or expand the brain. If your physical activity centers on typing, then your leg muscles will never rival Arnold Schwarzenegger’s. Likewise, if your mental exercise is radically low, then your brain will probably be on the scrawny side, according to a new view of brain development. For years, researchers underestimated the role that worldly experience played in brain formation. In the same way a person is genetically pre-destined to have blue eyes, the brain, they assumed, was internally programmed to bloom into a precise shape that held a specific map of nerve cells or neurons. This mission, they thought, was completed within the first few years after birth. But now a spate of studies shows that mental exercise can have profound effects on mental capacity. The identification of the most malleable brain areas and an understanding of the roles of age, gender and stress. The discovery of brain chemicals that execute the changes. Behavioral techniques and medications that could improve normal brain development as well as repair damaged brains. The first hint that mental stimulation was needed to bolster brain development surfaced in the 1960s. Researchers found that animals reared in an environment filled with interactive stimuli, including toys, grew a thicker and heavier cerebral cortex than those raised in an empty laboratory cage. Evidence began to snowball. For example, young male rats that frolicked in cages resembling playgrounds acquired more branches on their neurons and interconnections than rats that were sealed in isolated cages. Some of these brain differences also arose when the experiment was performed on middle-aged rats. Recently another study revealed for the first time that experience can increase neuron survival. Young female mice spent several months in an environment filled with tunnels, toys and running wheels. The mice developed more neurons in a brain area that is important for memory and performed a learning and memory task better than did isolated mice. Currently, the researchers are testing whether the change also occurs in older mice and monkeys as well as in other brain areas and the spinal cord. Other studies are revealing factors that can alter or counter the positive influences of a stimulating environment. For example, research shows that in some brain areas, such as the hippocampus and visual cortex, gender can affect the level of cell changes. Other studies on monkeys show that stress has the ability to stop new neuron development. While researchers continue to interpret how all the pieces fit together, some scientists also are beginning to test a stimulating environment’s ability to repair brain damage. In one case, researchers found that children raised in severely isolated conditions, where they were rarely touched or spoken to, had alterations in their brains and deficits in brain function. But submerging the children in intensely stimulating environments appeared to bring back some functions. In animal studies, other scientists discovered that an extremely stimulating environment could not only increase the number of connections in the brains of normal rats but could also repair some of the damage rats received when they were exposed to alcohol during the developmental period corresponding to the third trimester of pregnancy in humans. The environment required the rats to travel over rope, narrow beams and linked chains to reach food. Scientists believe that the research will lead to new behavioral and molecular therapies for brain disorders — as well as provide ammunition for your parents’argument that you should stop slacking off and mentally challenge yourself. While you’re at it, get to the gym. 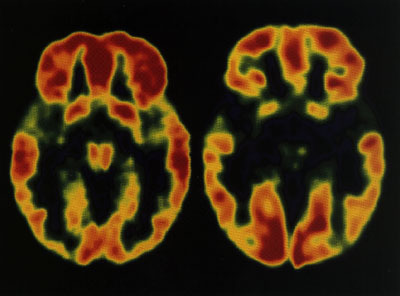 The images above reveal the brain activity of a normal child (left) and an institutionaiized romanian orphan who was negiected in infancy (right). The blue and black tones show that brain areas such as the temporal lobes, which oversee emotion among other functions, are practically inactive in the romanian child compared to the healthy child. Image from Children’s Hospital of Michigan.